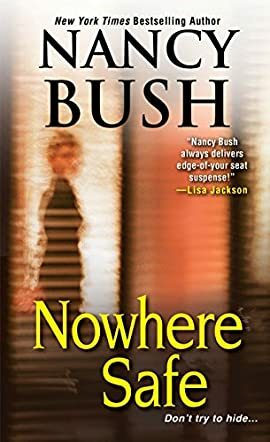 Nowhere Safe is an action thriller by best-selling author Nancy Bush. The story follows Detective September Rafferty, who at the start, has her hands full the first day back to work after an accident or crime. She was stabbed in the shoulder and is now making her way back to the day to day work of a detective. The elements of a paranormal suspense thriller combine with a clever, uniquely formulated tale. The author engages readers with a very fast paced story opening and holds on to them to the end. I found this story to be a well told narrative that demonstrates some very creative and unique story ideas. The beginning definitely feels rushed and it is hard to get involved with anything as the author tends to hold back too many details to make the characters interesting or to keep the readers involved in what is going on. It is confusing. But if you push through, things begin to fall into place. There is a trick to creating suspense, a formula most successful authors follow that comes from their voice and creativity. Bush is no exception. She weaves together a story that has readers holding their breath, waiting impatiently to turn the page. Her characterization and detailed imagery are concise and engaging without getting bogged down in extraneous or irrelevant detail. Her tempo helps create dramatic tension throughout this fast-paced thriller.